This statement was published by New Politics on January 20, 2018. I campaigned for governor with the slogan of “Demand More!” because Gov. Cuomo has governed as a social liberal but as an economic conservative. Although he touts the agenda he outlined in his January 15 State of the State and Budget presentation as “progressive,” New York progressives should not be satisfied. It is still a conservative economic program. Progressives must demand more. Any agenda worthy of the label progressive in New York must include a progressive economic program. It would start with three demands progressives have been pushing for years in New York that Cuomo has not accepted: the New York Health Act for a universal public healthcare program, full Foundation Aid funding for public schools, and tuition-free public college for all in-state CUNY and SUNY students. It would accelerate the increase in the minimum wage, which, despite the governor’s claims, is not $15 an hour in most of the state today and, by the time it is, it will remain a poverty wage. It would have a much stronger affordable housing program. It would encompass the Green New Deal that the Green Party has advocated for years, not the watered-down “Green New Deal” that Cuomo is now promoting. 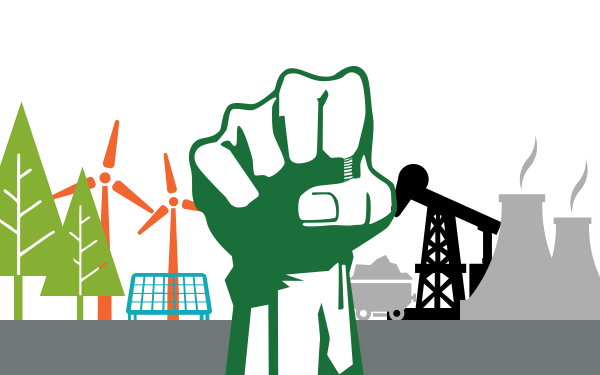 The Green Party’s Green New Deal would guarantee the economic human rights to a job, income, housing, health care, and education and embark on a rapid rapid transition to 100% clean energy by 2030 as the economic stimulus and sustainable foundation for economic human rights. Progressives should not let progress on social issues obscure the economic problems so many New Yorkers face every day. Inflation-adjusted wages have been stagnant for decades. Today more than 2 in 5 New York families suffer through periods without food, health care, housing, and/or utilities. 1 million New Yorkers lack health insurance. More than half of children in our cities are poor and attend segregated, underfunded public schools. Over half of New Yorkers pay a third or more of their income on rent. Gentrification and displacement is driving working class New Yorkers out of their own neighborhoods in the cities, while chronic rural depression in upstate New York is driving family farmers and small-town businesses off the land. Yet since Cuomo became governor, funding for social programs has been cut by a third. Economic development funds have been targeted to the corporate rich as tax breaks, grants, and subsidies. Working people have paid this corporate welfare with their taxes, but have seen little of it returned as new good jobs with higher wages. With the Democrats now in firm control of that chamber, progressives should expect passage of a big backlog of progressive social reforms that were blocked for years by Republican control of the Senate. These social reforms include abortion rights, gender equality, gun safety reforms, voting and campaign finance reforms, bail abolition, speedy trials, discovery reform, marijuana legalization, the Dream Act, and the Child Victims Act. Cuomo was never in the vanguard fighting for social reforms, from gay marriage early in his administration to marijuana legalization today. But he is a politician who moves in response to public opinion and the balance of power in the legislature. That should give progressives hope that we can push Cuomo further. The progressive agenda on social issues is far from exhausted. Glaringly absent from the Democrats’ agenda is a program to reverse the increasing segregation of New York’s metropolitan regions. New York’s schools and housing are the most segregated in the nation by race and income. Despite recent small gestures toward controlled choice for school integration in New York City, progressives have yet to push hard for a desegregation policy agenda that can move public opinion and force Cuomo and other politicians to “evolve” on this issue, too. School desegregation will require the redrawing school district lines and controlled choice within them. Controlled choice assigns students to schools based on a combination of their preferences and making all the schools relatively balanced by family income. Housing integration will require stronger enforcement of fair housing laws, inclusionary zoning, and a public housing program that builds high-quality mixed-income developments in the cities and the suburbs. Segregation is deeply implicated in the state’s economic inequality and insecurity where Cuomo’s economic conservatism is part of the problem, not the solution. New York State has the highest income inequality of any state in the nation. The share of income going to the top 1% has more than tripled from 10% in 1980 to 33% in 2015. By isolating minority and low-income communities from educational, employment, and cultural opportunities and resources, segregation feeds the growing economic inequality. A progressive economic agenda would go beyond Cuomo’s limited agenda on affordable housing. His call for closing vacancy decontrol and other rent control loopholes in New York City is only a start. Progressives will have to push hard to win those reforms against resistance from the powerful real estate lobby. A full progressive housing program would also include repeal of the state’s Urstadt Law to re-establish home rule on rent regulations, extending rent control authority to local governments statewide, and a public housing building program, rather subsides to private developers to build affordable units. Public housing is the most economical way to expand affordable housing and can play a significant role in integrating housing. Cuomo’s “Green New Deal” call for 100% renewable electric power by 2040 only addresses 20% of the state’s carbon footprint. We still need to see his definition of clean -- and a detailed plan with benchmarks. We need him to be clear that natural gas is not a bridge to a clean energy future but a gangplank to climate disaster. Cuomo’s diluted Green New Deal could give the concept a bad name. The Climate and Community Protection Act many Democratic legislators are pushing largely codifies Cuomo’s climate dangerous energy policies, which are flooding the state with fracked-gas pipelines and power plants. The CPPA’s goal of zeroing out carbon emissions by 2050 is too late. It does nothing to stop the increase in the state’s carbon footprint from the fracked-gas power plants Cuomo is pushing, from the corruption-ridden Competitive Power Ventures plant in Orange County to the state-sponsored environmental racism of powering state capitol buildings by the Sheridan Avenue plant, which has poisoned of the Arbor Hill black community for a century. Progressives and climate activist should get behind -- with the same laser focus we pushed the fracking ban in 2014 -- the New York Off Fossil Fuels Act. NY OFF will stop new fossil fuel infrastructure and build out a 100% clean energy system in New York by 2030 with provisions for a Just Transition to include low-income and minority communities and protect communities now dependent on fossil fuel and nuclear plants for employment and tax revenues. Particularly conservative is the embrace by Gov. Cuomo and Senate Majority Andrea Stewart-Cousins of making the 2% tax cap on local property taxes permanent. The tax cap is Cuomo’s signature economic austerity measure, a top-down, one-size-fits-all imposition on local governments and school districts in the name of property tax relief. In reality, the tax cap means the state budget is balanced on the backs of local property taxpayers who then suffer from underfunded local governments and school districts. A permanent cap will make permanent New York’s high property taxes and the fiscal austerity burden on municipalities and school districts. The progressive way to cut regressive property taxes and give local governments and school districts the resources they need is for the state to pay for its unfunded mandates, to fully fund Foundation Aid, and to restore state revenue sharing with local governments. Cuomo is fighting lawsuits for full school funding in the courts and has frozen revenue sharing. To raise the revenues for these and other needed programs, there are many progressive tax reforms that should be enacted. For starters, the income tax structure should be made more progressive by several progressively marginal tax rates for multi-millionaire incomes. Another progressive reform would be to keep the stock transfer tax, rather than rebate all of it to Wall Street traders. The central conservative economic feature of Cuomonomics that progressives must challenge is his supply-side, trickle-down policy of subsidies, grants, and tax breaks for the rich and corporations. The benefits have not trickled down to working people or depressed cities, towns, and neighborhoods. It only feeds the pay-to-play culture of corruption where economic favors flow to big campaign contributors. The progressive alternative is to revitalize the public sector with demand-side, bottom-up economic planning aimed at raising the incomes and living standards of working people and economically-depressed communities. Economic stagnation is an issue of insufficient demand, not insufficient capital in rich people’s hands to invest. The state should fully fund public services and invest more in physical and social infrastructure, including clean energy, sustainable agriculture, mass transit, public housing, broadband, education, health care, and environmental protection. This approach will increase effective demand and stimulate business expansion and jobs to meet the demand. Progressive will have good reason to celebrate the progressive social reforms we expect to achieve this year. But we are not done, especially on the economic issues. We must demand more.